DAYTONA BEACH, Fla. (Mar. 8, 2017) –- NASCAR® drivers are packing a sense of adventure for their 2,000-mile journey west as NASCAR Goes West celebrates the sport’s annual stretch of races at Las Vegas Motor Speedway, Phoenix Raceway and Auto Club Speedway. Following an exciting season launch at Daytona and Atlanta, drivers will take in the sights and sounds of the West Coast in conjunction with Whistle Sports and popular social influencers, including Frisbee trick shot artist Brodie Smith, the Harlem Globetrotters and acrobatic fitness couple Austin and Julian. In preparation for race days, NASCAR fans can follow the drivers along their off-track adventures on Snapchat and Instagram, and across all social media platforms using #NASCARGoesWest. Toyota helped kick off NASCAR Goes West with the launch of a three-week road trip highlighting the uniqueness of the southwest as well as various activities involving several of the Toyota drivers. Fans can also follow along through the @ToyotaRacing social media platforms along with daily updates on ToyotaRacing.com. NASCAR and Whistle Sports will share content leading up to each race weekend as Monster Energy NASCAR Cup Series™ and NASCAR XFINITY Series™ drivers put their trick-shot skills to the test with Brodie Smith, play hoops with the Harlem Globetrotters, and work out with fitness experts Austin and Julian. Additionally, popular Hispanic influencers Jay Mendoza and David Lopez will create videos from the race tracks, providing their followers with a behind-the-scenes look at what it’s like to experience a NASCAR race weekend live and in person. Throughout the campaign, unique and compelling NASCAR Goes West content from drivers, teams and tracks will be amplified across NASCAR social media platforms. The Kobalt 400 at Las Vegas Motor Speedway on March 12 is the first of three Monster Energy NASCAR Cup Series races that are part of NASCAR Goes West. The race will be followed by the Camping World 500 at Phoenix International Raceway on March 19, and the Auto Club 400 at Auto Club Speedway on March 26. All three Monster Energy NASCAR Cup Series races begin at 3:30 p.m. ET and will be broadcast live on FOX and SiriusXM NASCAR Radio, channel 90, with additional coverage on NASCAR.com. The Las Vegas race will be broadcast on the Performance Racing Network (PRN), and the Phoenix and Auto Club races on the Motor Racing Network (MRN). 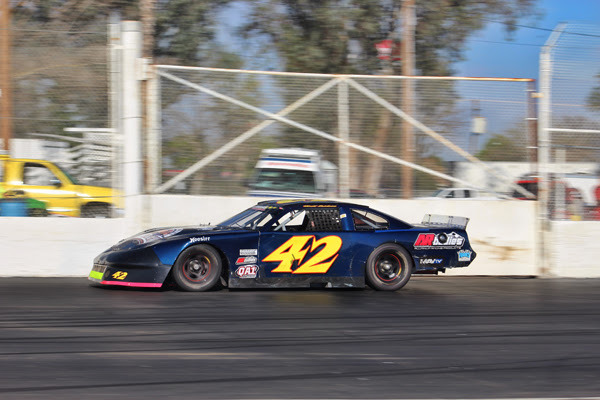 MADERA, CALIFORNIA (March 7, 2017) – Perhaps the biggest season of Stock Car racing in Madera Speedway's history begins on Saturday night, with the 2017 season opener including the RPM Mortgage Pro Late Model Series 125 for $5,000 to win. The Pro Late Models join the 51FIFTY Jr. Late Models 75 in a dual-headliner show both televised for a later broadcast on MAVTV. Toyota Sedans, Modified Super Toyotas, and F4s round out the big night of action. The one-third mile asphalt oval is located on the Madera Fairgrounds and enters its third season of televised racing. Last year, Matt Erickson won five races and was a perfect eight-for-eight in top-two finishes en route to the 2016 RPM Mortgage Pro Late Model Series championship. He won the season opener last year as a springboard to winning the first three races of the season. "We started out good last year winning the $5,000 to win, so this year hopefully we can come home with the championship again," Erickson said. "Same old car and old motor so nothing has changed on our end. Car is feeling good and its the best its ever been. Worst case scenario we can go back to the old faithful setup." Erickson will look to bottle that magic again against a hard hitting field including rookie Austin Herzog, 14, who will run both the Pro Late Models and Jr. Late Models this season. 2016 championship runner up Garland Tyler returns to action while still searching for his first Pro Series win, along with multi-time track champion Rick Thompson, Rookie of the Year Logan Zampa, and more than 20 other drivers from across the western United States. 2015 Pro Late Model champion Buddy Shepherd is also expected on Saturday night. Madera Speedway practically invented stage racing. Saturday's Pro Late Model race will open with a 75 lap stage before concluding with a 50 lap stage at the end of the evening. Five bonus points are awarded to the leader at the end of the first stage. The 51FIFTY Jr. Late Models is the first-of-its-kind in the world with drivers ages 10-16 racing in cars nearly identical to their Pro Late Model counterparts. The entire top-three of 2016 - Las Vegas' Dezel West, Clovis' Austin Herzog, and Mentone's Austin Edwards, are returning to defend their spot atop the series. A litany of female drivers make up the roster including most notably rookie Hailee Deegan of the extreme sports-famous Deegan family. Her teammate will be Jesse Love IV who moves up from the USAC HPD Midgets into stock cars this year. Several second and third generation drivers are advancing into the Jr. Late Models this year coming from divisions such as Mini Stocks, Karts, Mini Cups, and Micro Sprints in their quest to move up the racing ladder. "I've been racing Legends cars for about a year and got a couple of podiums. I haven't had much of an asphalt background growing up I've been racing off road," Deegan said. "I need to learn more about how to drive a bigger car. The perfect place for me is coming over to Madera. My goals are to get a couple of wins this year." Jr. Late Models will compete in an expanded 75 lap race this year. The drivers will race for 50 laps, stop on the front stretch for adjustments and TV interviews, then return to the speedway for a thrilling 25 lap final stage. An open practice kicks off the weekend on Friday before a full day of action on Saturday. Friday practice runs from 5 p.m. - 8 p.m. On Saturday, pit gates open at 11 with practice from 12:45 p.m. - 2:45 p.m. Qualifying will follow with heats races and the F4 main event at 5:00 p.m. Opening ceremonies and the main events begin at 6:00 p.m.
Tickets for this great night of racing are $15 for adults, $13 for seniors and military, $7 for youth ages 6-12, and kids five and under are free! For more information on the RPM Mortgage Pro Late Model Series and Madera Speedway, visit RaceMadera.com or follow them on Facebook. Madera Speedway is located on the Madera Fairgrounds on Cleveland Ave and 99. Race fans can catch up on Madera Speedway racing with "Madera Racing" airing Thursdays on MAVTV at 8 p.m. Eastern / 5 p.m. Pacific. Madera Speedway racing is also available on the LucasOilRacing.TV app.